Rollers have been supplied in a variety of materials and sizes according to specific design. Units vary so much that these are always made to order. The largest so far supplied for coiled tubing is about 2'6" long x 5" diam. We have the present capability to make polyurethane coated rollers to around 10' x 2' diameter (3m x 60cm), with surface profiling if required. These are supplied for major pipe and tube handling operations, among others. Please enquire if of interest. Function: to carry the tubing from the reel over the gooseneck. 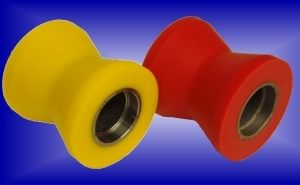 Material: Diabolo shape of standard roller is in polyurethane 95A cast around metal housing. The fan rollers are similarly made but are straight rollers. Idler rollers and level wind rollers are made of a more rigid polyurethane but contain no metal centres. Rollers can on request also be, and have been, supplied machined from nylon, oil-filled nylon, or graphite-filled nylon, etc. or steel, and are then priced accordingly. We have supplied much larger sized diabolos and assemblies to accommodate up to 3.50" tubing so far. These are not stock items, but are made to order. We can easily supply up to 4.50" CT rollers if requested. Please note that the standard roller was originally designed around 1" and 1.1/4" tubing; it copes well with 1.1/2" and 1.3/4" and reasonably well with 2"; but at 2.3/8" heavy wear is being reported on occasion; it would be advisable to use larger scale handling equipment.